Bikes — Tumbleweed Bicycle Co. The Tumbleweed Prospector is a rugged and adaptable mountain touring bike. 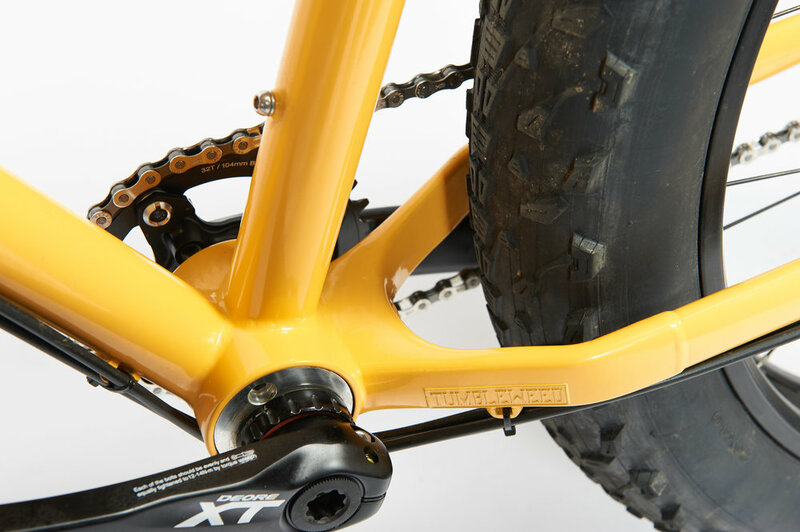 It's the very first production bike designed and engineered to run (up to) four inch wide fat bike tires while maintaining the use of standard width mountain bike cranksets and eliminating the need of any proprietary fat bike specific components. In January of 2014, a group of friends and I rode fatbikes through Patagonia for six weeks. We had ridden across the Indian Himalayas previously on mountain touring bikes, but this was our first trip with four inch wide monster tires. We loved the ride, the grip, and the ability to float over loose terrain, but after three weeks of riding for 8-10 hours per day, some of us began having nagging pain in our achilles tendons. The wider pedaling stance of a fatbike compared to a 'traditional' mountain bike was a compromise we hadn't thought too much about before this trip, but it became clear that we needed something different. Cass Gilbert and I spent many nights around the campfire on that trip comparing the various bike setups we'd used on trips over the years and fantasizing about what our ultimate mountain touring bike would be able to do. Large volume tires, standard parts you can find even in a remote bike shop in the developing world and a normal pedaling stance were high on this list. Upon returning home to California I starting working on our idea. A year and half later in the summer of 2015, after convincing some extremely talented people to help out, we had three prototype Tumbleweeds ready for another six week trip, this time to Mongolia. The tour was a success, and the bikes performed as we had hoped. Another year of development has brought us to the current production model. The Prospector has a trail bike geometry, and is well suited on singletrack and technical trails. 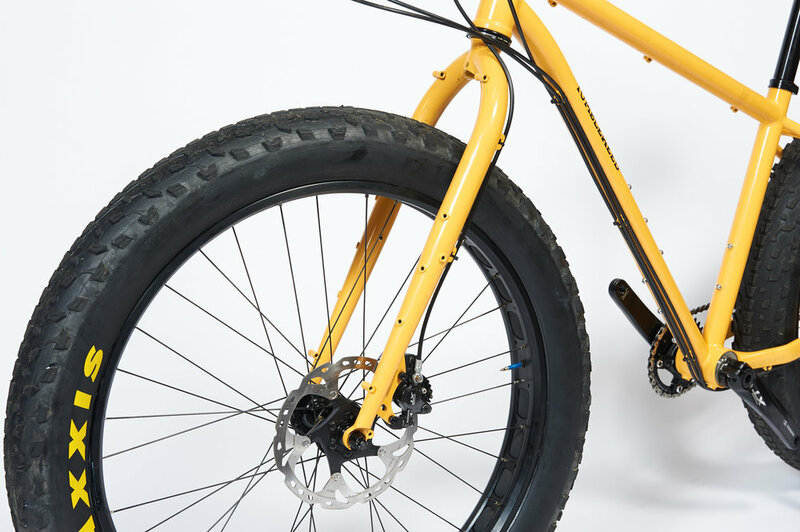 The headtube is slightly taller than other mountain bikes, for a more upright riding position and to open up the front triangle for maximum volume with a framebag. These bikes have been ridden on all manner of terrain and have proven to be nimble and surefooted, whether loaded with bikepacking gear or stripped down to the bare essentials. While the Prospector is fully derailleur compatible (front and rear), we designed this bike primarily around the Rohloff SPEEDHUB, a 14 speed internally geared hub that has proven itself to be supremely dependable and capable. We've been using Rohloff hubs on all of our trips for over 6 years and tens of thousands of miles, and have ridden them through sand, mud, snow and at elevations of up to 18,000' without issue. The Prospector is built around a special 73mm version of Phil Wood's eccentric bottom bracket, made just for us. This system has proven to be rock solid with no slipping or creaking at all. The benefit of this bottom bracket is that it keeps the rear wheel locked in exactly the correct spot, allows tensioning of the chain, and lets the rider set the bottom bracket height for their type of riding. The Prospector ships with a 135mm spaced chromoly fork with rear wheel disc brake spacing. This is the only fatbike fork standard with any kind of expedition benefit, as you can find a replacement rear disc wheel or hub nearly anywhere in the world. It also adds some additional flexibility in the form of drivetrain redundancy, since the front and rear wheels are swappable. For example, one could use a derailer hub in the rear and a single speed hub in the front for a long trip in a remote location without access to any bike shops. The frame is compatible with any 100-120mm travel 29er suspension fork, but we like the RockShox Bluto because it works well and features the same wheel and tire clearance as the frame, so you can run 26x4", 650Bx3.25" or 29er tires up to 3" wide to match the rear. Tumbleweed Prospectors are available as either a frameset, a frameset module with a Rohloff SPEEDHUB, or as a complete bike. Framesets are In stock now! To order your Tumbleweed, select from the options below. Chainring clearance: 24-38 Mountain Double, or 24-32-42 Mountain Triple. Chainring clearance is only limited when the Eccentric BB is in the far rearward position. Larger chainring combinations may be used if this rear position is avoided. In order to use a 3" tire with derailleurs, a 1x or offset 2x crankset must be used.